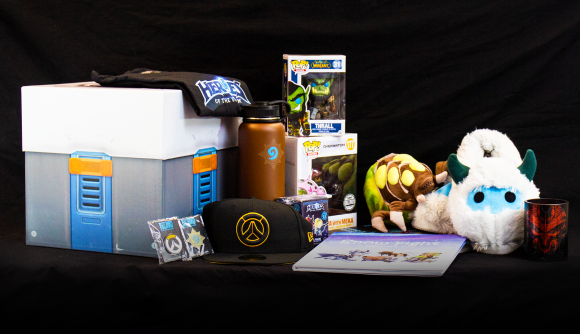 Win an Overwatch loot box full of Blizzard gear – books, a plushie, t-shirt, and more! How much of a Blizzard fan are you? Do you play all the developer’s games or are you dedicated to just one of them – World of Warcraft, Overwatch, or Heroes of the Storm? Well, no matter how deep your Blizzard fandom goes, you could always be more of a fan. How? You could own a real Overwatch loot box, and not only that, one that’s packed full of Blizzard goodies for you to enjoy. That’s what we have up for grabs in this giveaway right here. We’re talking hundreds of pounds worth of Blizzard merchandise that could be all yours and it won’t cost you a damn thing. Isn’t that dandy? There’s a plushie, Pop! Vinyls, books, a t-shirt, pins, and much more. Unfortunately, we can offer this Blizzard loot box to UK address holders only. Sorry about that. Anyway, let’s move on to the good stuff, and be more specific in what you could win, so long as you enter the giveaway. Now, if you want to enter the giveaway, you’ll need to use the widget below. Every action you complete is worth one entry into the giveaway, with the more actions you complete increasing your chances of winning.